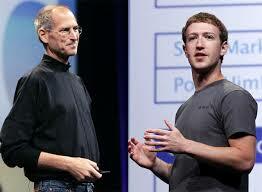 This two individuals can be considered as the modern father and son of technology. They are innovators, entrepreneurs and inventors who have revolutionized how people interact and use technology to communicate and for entertainment. Steve Jobs was the founder of one of the fortune five hundred companies and the world’s leading computing and mobile development company Apple Inc. He was an entrepreneur, inventor and innovator whose success in the technology industry can be attributed to an eye for detail, determination and an ability to survey the trends in the market and make responsive decisions. As the founding further of Apple, Jobs was flexible and involved in major developments such as in music and video as well as hardware developments. On the other hand, Zuckerberg is considered the most young and enterprising individual in the technology industry. As the founder and chief executive officer of Facebook, this individual is enterprising and continuously engages new ideas in social marketing and connection. Zuckerberg is an internet entrepreneur whose investment in social media has changed the way people interact, conduct business and communicate. With skills in computer programming, he has horned his skills in Harvard University and as of 2003, with the help of his friends he launched Facebook a social networking site from the confines of his dormitory room. This article evaluates the individual commitments of these two individuals in the technology sector and provides their contribution and roles on how they have changed how people interact, communicate, share and conduct business online. It is through their innovative ideas and commitments to success that they have utilized the internet for the mutual benefits of all users in a global scale. Evaluating their bibliographies, it is true that they are special minds worth of emulation.